I knew I wanted to be a pro cyclist when: I think I knew as soon as I started riding at around 11 or 12 years old. There was just something about it—the riding, the racing and the travel opportunities that it would provide—which interested me from a young age. Greatest racing memory: Finishing 8th at the Tour de Bretagne in 2015 was an important race for me. It was always a big race in the U23 calendar and I was just 19 so it was great to feel like I had delivered over the course of the whole seven-day race. If I wasn't a pro cyclist: I’m slowly studying economics at university, so when this adventure is over it would probably be something to do with that. 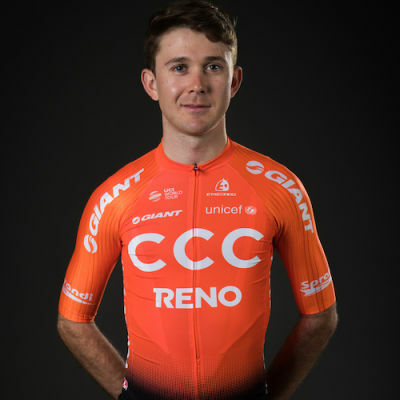 American rider Will Barta will steps up to the UCI WorldTour with CCC Team in 2019 after impressing at the U23 level. Last year he gained valuable WorldTour experience at the Amgen Tour of California, where he scored a top-10 stage finish. The American had a number of top-10 results in 2018 including third overall at Le Triptyque des Monts et Chateaux. In 2017 he was fourth at the U23 Liège-Bastogne-Liège and also fourth at the US National Time Trial Championships.